Colorful dancing robot men and weird Lego robot creatures are coming... but not to Lego stores. Lego Education's new Spike Prime is a kit aimed at classrooms looking to incorporate Lego into lesson plans, targeting kids aged 11 to 14. The new STEAM robotics kit was announced today at an event in New York City. Lego Mindstorms have been around for years. The Mindstorms EV3 robotics kit remains a staple of many learning centers and robotics classrooms. Lego's newest kit looks more like Lego Boost, a programmable kit that aimed to win over families in 2017 and was compatible with regular Lego bricks. It's compatible with Lego Boost, Lego Technic sets and classic Lego pieces, but not with Lego's previous Mindstorms accessories. Lego Mindstorms EV3 is remaining alongside Lego Spike Prime in Lego Education's lineup, and looks like it's aiming more at the high school crowd, while Lego Spike Prime could bridge to that higher-end projects. The Spike Prime set is created specifically for grades six to eight. It uses an app that uses visual Scratch programming and aims to adopt the Python programming language by the end of the year, according to Lego Education executives. The robots made by Spike Prime look cute, and Lego Boost-like, but not necessarily as complicated as some Mindstorm kits. The central processing hub that drives the Lego Spike Prime robotics creations has six input and output ports, and connects with sensors including an RGB color and light sensor, a force-sensitive touch sensor, and an ultrasonic distance sensor for measurement and navigation. The hub also has a six-axis accelerometer and gyroscope, a speaker and a 5x5 LED screen. The hub has a 100MHz M4 320 KB RAM 1M FLASH processor. 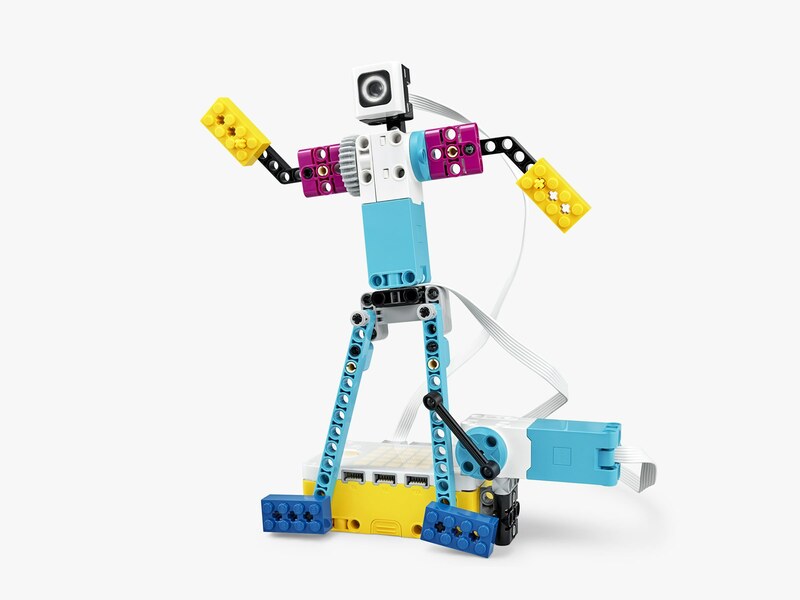 Lego Education already has competition in the school STEAM space, including Sphero (whose expandable RVR robot is arriving later this year), and LittleBits, which already has plenty of kits. The company behind the kid-safe plastic-printing 3Doodlerpen is also making a big education push this year to incorporate the product into more school lesson plans. Could Spike Prime be a hint of a future Lego Boost kit? It certainly looks like it could be the inspiration for a future Boost sequel. Lego's only targeting schools with this product, though, not homes. Could there eventually be a home crossover component, or is Boost meant to be that kit already? We'll follow up with more impressions from Lego Education's New York press event later today.